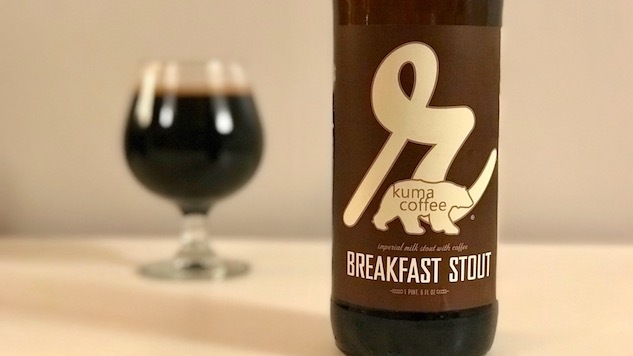 Here’s what I want out of a breakfast stout: I want a stout that makes me think I accidentally spilled half a cup of coffee into my beer. And not just crappy, gas station coffee, but really great, thoughtfully sourced and carefully roasted coffee. I want a beer that tastes like it should be paired with a donut and a side of bacon. Reuben’s Brews, out of Seattle, gives me the breakfast stout I want, and then some. It pours like a cup of black, but smells like a fresh bar of dark chocolate, all mildly roasty and sweet. The chocolate dominates the sip as well, hitting you hard with some bitter-sweetness before the roasted, coffee elements kick in. The mouthfeel is smooth, and a little milky (thanks lactose! ), although there is more carbonation than I expected. There’s some fruitiness on the backend as well, like sweet cherries, which I assume comes from the coffee. If you let the beer sit in the glass for a bit, the carbonation settles down and the lactose comes out a little more, delivering more of a smooth, caramel element. The booze stays pretty well hidden beneath all of these well-balanced layers, but at 8.4%, this beer is no joke. It’s not too sweet, it’s not too bitter, it’s not too anything so it’s easy to knock it back without thinking about the repercussions. You can find Breakfast Stout now through January in big 22-ounce bottles. I can’t think of a better beer to help you get through the holidays. If you’re looking for more imperial stouts for winter, check out our recent blind tasting of the style.